In this extended article, Tobias Lock examines the process for a Member State to leave the EU and the effects of withdrawal, in the context of the upcoming EU referendum. He suggests that, should the UK leave the EU, some form of EU-UK agreement will likely be reached, although the shape of any deal is very much open to question. A great deal of uncertainty surrounds the legal questions associated with the process for leaving the EU and the implications of that process for Scotland, should the UK vote for exit in the upcoming EU referendum. In the first place, we do not know much about the UK government’s negotiation agenda, let alone the possible outcome of the envisaged renegotiation. In addition, the key legal provision for withdrawal of a country from the EU has never been ‘road tested’. A UK withdrawal – should it take place – would be a first. For these reasons, any answers we have can only be tentative for now. At the outset, it is important to clearly distinguish between the domestic (UK) legal perspective and the perspective of European Union law. Some of the procedural ramifications for and the effects of a possible withdrawal would be determined by domestic law and open to political negotiations at the national (and possibly sub-state) level. Others are pre-determined by EU law. It is also important to realise that a UK withdrawal from the EU would have effect for the whole of the United Kingdom, and thus include Scotland. In the absence of any specific arrangement, Scotland would find itself outside the European Union. Article 50 of the Treaty on European Union (TEU) outlines the procedural steps for a Member State wishing to withdraw from the EU. This provision was introduced by the Treaty of Lisbon and has consequently only been in force since 1 December 2009. It has never been used. The article sets out the steps necessary under the law of the European Union. As Article 50(1) TEU makes clear, EU law does not interfere with the constitutional requirements in the Member State concerned. In particular, EU law makes no provision for sub-state entities, but leaves these questions to be determined by the law of the Member States. Procedurally, Article 50 requires that a Member State notify its intention to withdraw to the European Council. Under the provision, no reasons need to be given. In this case, the UK government would need to inform the President of the European Council. EU law does not determine how the decision to withdraw is reached internally. In particular, it does not require that the national government hold a referendum or consult with its sub-state entities, such as Scotland. Therefore, the wording of the referendum question or the extent of the franchise are of no concern to EU law. The treaty foresees two options in which withdrawal can occur. The first option is the conclusion of a withdrawal agreement. A withdrawal agreement would not only set out the exact ramifications of leaving (eg the withdrawal date; the role of UK representatives in the EU institutions during transitional periods; what would happen to civil servants with British nationality working for the EU institutions), but it would also regulate the future relationship between the EU and the UK. Article 50 does not provide any specifics. This means that the future relationship is negotiable in its entirety. Negotiations would take place in accordance with Article 218(3) of the Treaty on the Functioning of the European Union (TFEU). The Council of the EU would nominate a negotiator or negotiating team for this purpose. This team would normally involve officials from the European Commission. The agreement would then need to be concluded between the Council (acting with a qualified majority) on behalf of the European Union and the UK government on behalf of the UK. For this purpose, the UK would not participate in the Council. The qualified majority would be calculated on the basis of the remaining (currently 27) Member States. It is noteworthy that the treaties envisage a bilateral agreement between the EU and the UK. In contrast to an accession agreement for a new Member State, it would not necessarily be multilateral (concluded by all Member States) and would thus not modify the EU treaties themselves. In consequence, any withdrawal agreement would need to comply with the treaties. A future relationship between the EU and the UK could not contradict them. However, for practical reasons, withdrawal might be achieved through a mixed agreement. Mixed agreements are concluded between the EU and its Member States on the one side (hence ‘mixed’), and other countries or organisations (in this case the UK) on the other. They are very common in the EU’s external relations. Mixed agreements are often used when the EU itself does not have the competence to conclude a deal on its own. This can be the case where a political dialogue is included, such as the Partnership and Cooperation Agreement with Russia, or where there are direct budgetary implications for the Member States. Given the immense complexities associated with a withdrawal agreement, it might become necessary to include the Member States, as the EU alone might not have competence in all the areas covered by the deal. Accordingly, the Member States would be parties to the agreement as well. The resulting ratifications in each country could considerably prolong the process. The second option is that no agreement is reached. In this scenario, a country ceases to be a Member State two years after notification of its intention to withdraw, unless the European Council decides to extend this period, in agreement with the country in question. The period could be extended, for instance, if negotiations are still ongoing after two years. Should the UK’s membership terminate on this basis, there would be no agreement regulating future relations with the EU. The UK would be in the position of a third country. The main agreements governing trade relations between the UK and the EU in such circumstances would likely be those under the WTO. In practice, such a reality is unlikely to come about, as it would be in the interest of all parties concerned to come to an arrangement. The effects of withdrawal are that a Member State’s rights and obligations under EU law cease to exist. Article 50(3) TEU makes clear that this only takes place from the date of withdrawal. The UK’s rights and obligations as part of the EU would continue right up until the day it left. However, on that day, EU law would only cease to have effect in the UK in its relations with the EU. In order to understand this situation, we need once again to distinguish between the domestic perspective and the EU perspective. From a domestic perspective, EU law would continue to have effect within the UK through all the legislation passed by the UK Parliament designed to implement EU law. The most important piece of legislation in this regard is the European Communities Act 1972 (as amended). As long as, and insomuch as, all this legislation is not repealed, EU law will continue to apply in the UK. In addition to constitutional statutes such as the European Communities Act and the Scotland Act 1998 (in which Section 29 makes direct reference to EU law), a large amount of other legislation has been influenced by and is (partly or wholly) based on EU law. Examples include the Equality Act 2010, the Working Time Regulations and the Environmental Impact Assessment Regulations. From a legal point of view, this situation poses an additional challenge. Should this legislation remain on the statute books, a question arises as to its interpretation. As long as the UK is a member of the EU, legislation based on EU law (mainly EU directives) must be interpreted in accordance with it. From the point of view of EU law, this obligation to interpret in accordance with EU law would cease from the date of withdrawal. Yet there may be cases that arise before the withdrawal date – for example, a working time dispute between an employee and an employer where the material facts occurred before the UK’s EU membership ended. In these scenarios, it is likely that EU law would continue to apply in the UK as it did before withdrawal. So even after the UK had left the EU, there could be a great number of legal relations still governed by EU law. As for cases where the material facts occurred after withdrawal but the legislation governing them was originally based on EU law and is still in force (eg the Equality Act), it is unclear how such legislation would be taken. It could still be interpreted in light of EU law or it could be given a ‘new’ and entirely domestic interpretation. This interpretation would be a matter for domestic law and may eventually have to be determined by the courts. In addition to the position of the UK as a Member State, the legal position of people living in the UK could change fundamentally following an EU exit. We must distinguish here between UK citizens and other EU citizens currently resident in the UK. As far as UK citizens are concerned, they would probably lose their status as EU citizens. While the concrete ramifications of future relations between the EU and the UK would be subject to negotiations, it is unlikely that the citizens of a non-EU Member State would be accorded EU citizenship. Depending on this future relationship, their rights may differ considerably. While, for instance, citizens of countries in the European Economic Area (EEA) may reside in another EEA country for up to three months even without being economically active, EU citizens have much greater rights once they have moved. For instance, they enjoy voting rights (active and passive) in municipal and European elections. As far as EU citizens residing in the UK who do not have British citizenship are concerned, their status may change accordingly. Depending on the details of the withdrawal agreement, they may even become subject to immigration control after withdrawal. The same would be true for UK citizens residing in other EU Member States. Similar effects would be felt by legal persons based in the UK. The future EU-UK relationship would determine their access to the EU internal market – the free movement of goods, services, capital and the freedom of establishment. A number of possible future relationships are conceivable. There is no precedent, as no Member State has ever left the EU. The first option would be for the UK to re-join the European Free Trade Association (EFTA) and join the European Economic Area. This would give natural and legal persons in the UK access to the EU internal market (free movement of goods, services, capital, establishment, workers) and give natural and legal persons from other EEA countries access to the UK’s market (including workers). From a Scottish perspective, it is worth noting that EEA membership does not include participation in the Common Agricultural and Fisheries Policies. The second option would be a sui generis arrangement, along the lines of the relationship between the EU and Switzerland. That relationship is currently governed by a number of bilateral agreements, which include the free movement of goods and persons, but not of services. It is important to underline that the EU regards this relationship as cumbersome to maintain, as it lacks an institutional structure. Therefore, it is likely that the EU would be reluctant to agree such an arrangement with the UK. Nevertheless, this option cannot be excluded and need not necessarily follow the Swiss model. The third option is that no agreement is reached. This is an unlikely scenario and would result in the UK having to rely on general international trade law, such as WTO law, for its trade relations with the EU. Importantly, the EU would be able to levy customs duties on UK products. 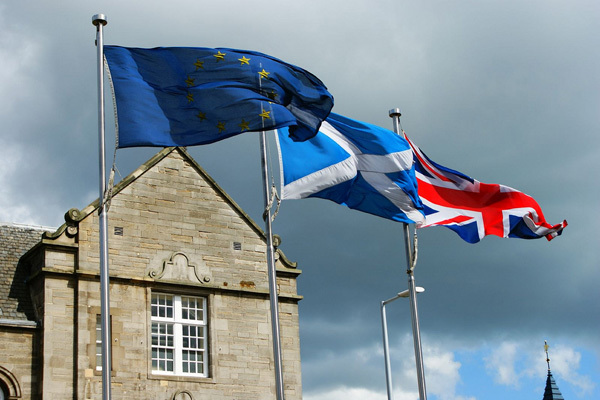 The author recently gave written evidence to the Scottish Parliament’s European and External Relations Committee inquiry on EU Reform and the EU Referendum: Implications for Scotland. Dr Tobias Lock is Lecturer in European Union Law and Co-Director of the Edinburgh Europa Institute at the University of Edinburgh. His research focuses on the EU’s multilevel relations with other legal orders, including the European Convention on Human Rights.